French Photo Du Jour: Mark Your Calendar! There's apparently a lot of excitement for this farewell tour... especially in La Source near Orléans, where these billboards popped up this week on several street corners. 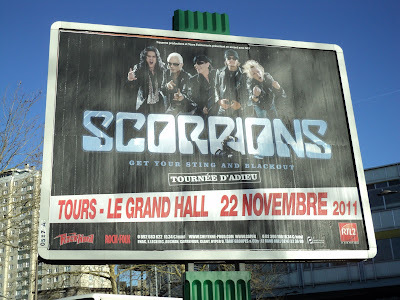 Yes, after 45 years, the members of Scorpions are calling it quits, and the city of Tours, an hour and a half from here, is among nine French cities chosen for their tournée adieu.